A group of teenagers were trained in cattail propagation techniques by a partner in the Life Biomass C+ project. 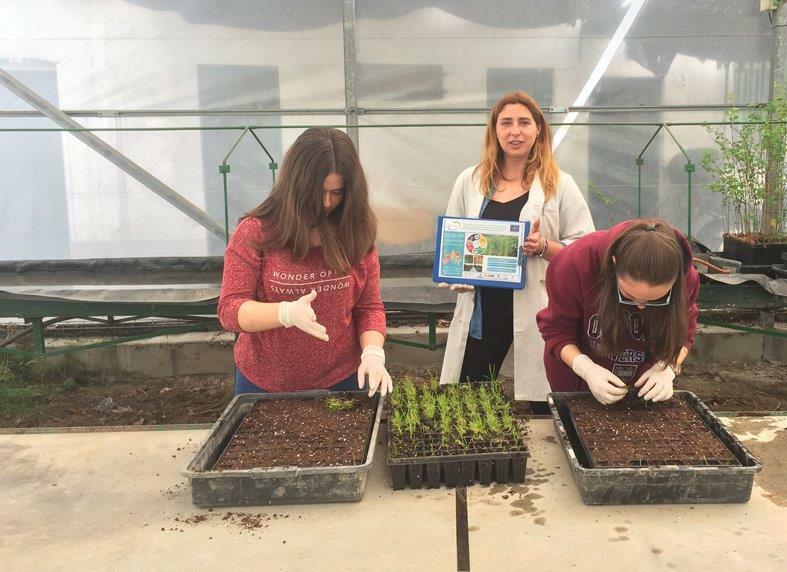 Members of the Agro-Energy Group (GA-UPM) have contributed to the 10th edition of the programme 4ºESO+Company of the Autonomous Community of Madrid (Spain), an education programme addressed to 14-15 year-old teenagers. The objective of this programme is to facilitate short stays to the best students so that they can increase knowledge, acquire new skills and make informed decisions on their future. On 2-3 April 2019, four teenagers selected for that programme visited the facilities of the GA-UPM; they came from the following educational centers: ‘I.E.S. Palomeras-Vallecas’; ‘Colegio Rafaela Ybarra’; ‘I.E.S. Isabel la Católica’; and ‘Colegio Altamira’ of Madrid. The students had the opportunity to understand the concept of Life Biomass C+, visit green floating filters in the facilities of GA-UPM, and know biomass applications. Furthermore they were trained in the preparation of seedbeds from cattail seeds, the management of cattail seedlings, and subsequent transplanting works.